A fun and challenging Chair Cardio Workout you can do with a foot or ankle injury. A fun and challenging Chair Cardio Workout you can do with a foot or ankle injury. Work your heart and muscles with this exercise video routine. Stay fit, healthy, and positive with a foot or ankle injury with my full length “Hurt Foot Fitness” program. It’s so cool to me that my Youtube channel has allowed me to connect to so many people around the world who are dealing with physical challenges and injuries. My heart melts when I read the emails, facebook messages, and comments. I know exactly how you feel! I have been in your shoes (and your boot) and am here to help you feel better. Dealing with injury is one of life’s greatest challenges. I am committed to creating content that helps you stay strong and positive. This 20-minute advanced Chair Cardio Workout was filmed to help you get your blood flowing, heart pumping, metabolism moving, and keep your body healthy. The workout is non-weight bearing and can be done at home or at the gym. These exercises will work your total body without putting any pressure on your feet your ankles. You will feel your arms, legs, lungs, and abs burn while you work your cardiovascular system. This advanced Chair Cardio workout will get your heart rate up, get you to work up a sweat, and help you feel alive again! This is an advanced Chair Cardio workout that moves at a fast pace. YOU MUST be cleared by your doctor or physical therapist before starting this or any exercise routine. Please modify as needed and make this workout help you feel GOOD. I used a pillow as a cushion for extra support on my chair during this workout. 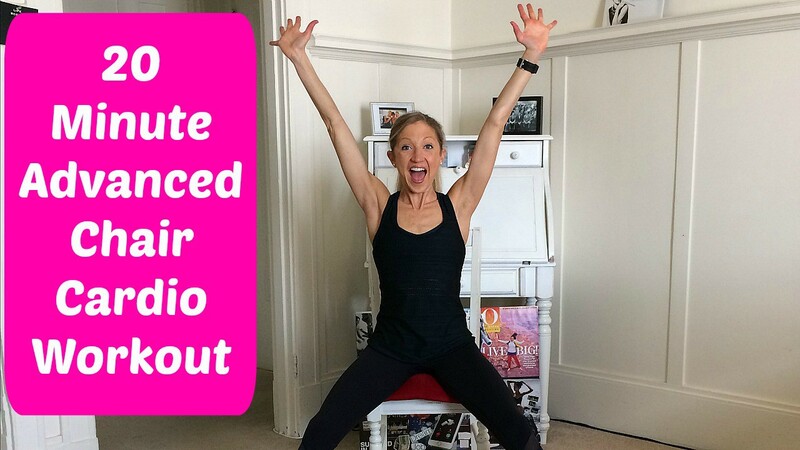 Are you ready to get your heart pumping and your muscles working? Sit and be fit with me! Press play! If this video helped you, please, HIT LIKE, SUBSCRIBE to my channel, and share this video with your friends! Your support helps me keep creating content you love. Let me know how you feel after you try this Chair Cardio Workout in the comments below. I believe in you and am here to support you in feeling good. Stay strong and stay positive. Remember, every day is a choice. And injury or not, it’s up to you to make it great. Originally published at www.carolinejordanfitness.com on March 30, 2017.